Boil 500g scrubbed baby new potatoes for 15-20 minutes until tender. Test one with a fork: it should go straight through without making the potato fall apart. Cool, then cut each potato into halves or quarters. Mix 2 finely chopped small shallots with 4 tbsp light olive oil, 1 tbsp white wine vinegar and 1 tsp Dijon mustard. Season and taste, adjusting the quantities of oil and vinegar if necessary. 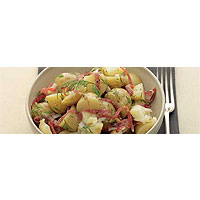 Lightly crush the potatoes with a fork and fold the dressing through, along with 1 tsp mustard seeds, 2 diced gherkins, 1/2 bunch chopped fresh dill and 8 slices finely shredded pepper salami.